The rich and varied landscapes of the tropics have long been mined for natural resources – from rubber and lumber to fruit, medicine, and sugar. Tropical landscapes have also been the source of inspiration for artists who are captivated by their color, bounty, and perceived otherness. The Delightful Land showcases the work of four contemporary artists who draw strong formal influence from the modernists Paul Gauguin, Henri Rousseau, and Henri Matisse, but who reinterpret these iconic landscapes in our postcolonial, globalized age. The exhibition takes its title from a painting by Paul Gauguin (Te Nave Nave Fenua in Tahitian), a tropical rendition of Eve’s fall from grace, which can be seen as an allegory for the artist’s Tahitian experience. Gauguin sought an earthly paradise in Tahiti as an escape from the modern, industrialized life of Europe, but was disappointed when he found its people devastated by illness and its traditions diluted by colonial influence. Though he was critical of colonialism and its effects, he too embraced and perpetuated the myth of the “Other.” His paintings of French Polynesia and its native people created an idealistic image of the tropics that was based more on his imagination than reality and framed the public perception of these places as exotic and otherworldly. Today, tropical imagery is ubiquitous and far less exotic. Our culture is saturated with the visual tropes of these landscapes, from print patterns on summer clothes to resort advertisements to Saturday morning cartoons and reality TV. The four artists in The Delightful Land must therefore engage with the tropics through the filter of contemporary popular culture in addition to the art historical legacy. Ryan Schneider’s recent paintings feature closely cropped portraits of female figures in beachside landscapes. These works present an update on Gauguin’s exoticism and his focus on women in nature. In Inner High Priestess, Schneider paints the head and shoulders of a dark-skinned woman facing away from the viewer and towards the shore, the roiling waves and ghostly palm fronds overlapping and intertwining with her long wavy hair. Schneider’s use of color has roots in Gauguin’s vivid palette, which contrasted warm red and yellow tones against cool backgrounds and strong black outlines. Schneider has adopted the heavy use of black, but his colors are even more electric. In two other portraits, Topanga and La Selva, the features of the women are framed and defined by the form and shadows of leaves, merging the figure and the landscape. By locating his tropical portraits on the beach, Schneider brings attention to a new type of exploitation: the tourist economy of resort locales. The women in Schneider’s beach scenes could be locals or tourists in search of the same tropical paradise imagined by Gauguin. Though, by focusing more directly on portraits of individuals, Schneider avoids Gauguin’s romanticism. Kristina Lee’s work is also preoccupied with the human presence in the tropical landscape. Similar to Schneider, Lee merges foliage with the human form in Double Trouble and Shemo, but her figures are more abstract and difficult at first to identify among the vegetation. What first appears to be a leaf doubles as an eye, and the same sharp spiky lines that outline palm fronds also form fingers and toes. In another body of work, Lee takes direct inspiration from Henri Rousseau’s Woman in Red in the Forest, his surreal depiction of a Victorian woman strolling through thick jungle. Like many of his tropical paintings, this one presents a figure set against a wall of green vegetation. Lee’s interpretations, both titled W.I.R.I.T.F. (an acronym of the original’s title), focus in on sections of the foliage in Rousseau’s painting. Using an eerie palette of greens, she produces claustrophobic tangles of tropical undergrowth so dense that the woman in red, omitted by Lee, may well have been swallowed by it. In style and approach, Amy Lincoln’s paintings also recall Rousseau’s primitivist dreamscapes. Rousseau never visited the tropical locales he loved to paint, but instead based his visionary jungle paintings on images in picture books and visits to Paris’ Jardin des Plantes. Lincoln’s landscapes, such as Hyacinth Macaw, Bird Island, and Three Eclectus Parrots, are also based on secondary sources. Her birds and plants are informed by internet research, books, and her own observations in botanical gardens, zoos, and even pet stores. Whereas Rousseau had little regard for botanical accuracy—his overblown flowers primarily served to add important accents of color in his predominantly green paintings—Lincoln’s subjects are more accurately researched and paired with the appropriate landscape and fauna. Nevertheless, Lincoln’s tropics are artifice: paintings of archetypal landscapes that are based on popular imagination more than reality or first-hand experience. In Bird Island she explores the common visual trope of the tiny deserted tropical island with a single palm tree and a cast-away in the midst of a vast, empty ocean. Lincoln’s rendition of this classic island scene is densely populated with a variety of plants, tropical birds, and fish. With her attention to ecological accuracy and matter-of-fact style, Lincoln instills these fictional yet iconic images with an uncanny quality that makes them both strange and familiar. In contrast, Natalie Westbrook’s works on paper are directly informed by her first-hand experience during a recent art residency in Haleakalā National Park in Maui, Hawai’i. The jagged, abstracted forms in her paintings, both cut and drawn, are inspired by the plant life growing in the park’s volcanic landscapes, specifically the rare Haleakalā silversword. She also incorporates tropical plant life directly by applying paint with fern fronds and using graphite rubbings of leaves. 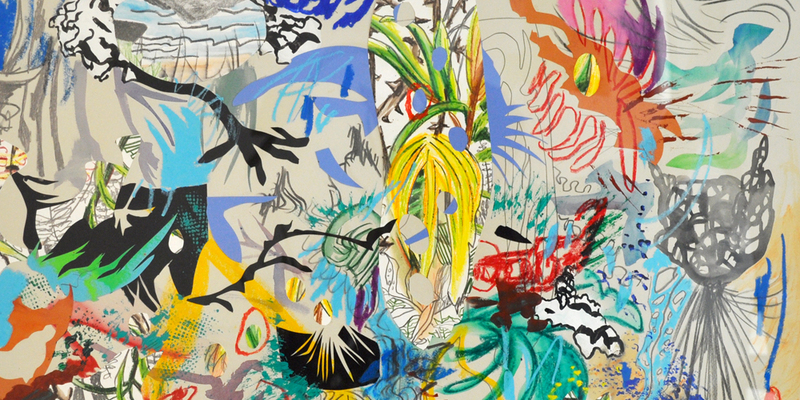 Westbrook employs a variety of traditional techniques and styles in each work, combining collage, acrylic, watercolor, ink, and graphite to produce an image that is at once a finely detailed rendering of tropical plants and an abstract, deconstructed landscape composition. These works evoke Henri Matisse’s use of color, pattern, and cut paper in his last body of work, which was no doubt inspired by a three-month visit to Tahiti in 1930. Westbrook’s layered mixed-media paintings are not as decorative as Matisse’s cut-outs, but they share his flattened composition, emphasis on plant forms, and playful sense of color. Although Gauguin and Rousseau may be the more obvious formal touchstones for this exhibition, Matisse’s approach is the closest in spirit to the artists presented here. The strong narrative elements in the works of Gauguin and Rousseau heightened the exoticism and romanticism, whereas Matisse was more focused on the aesthetics of color, pattern, and decoration. Faced with a subject matter that exists to most people in idea only, the artists in The Delightful Land examine the tropics with critical distance and a strong awareness of the images that saturate our culture to produce works that explore landscapes that exist in between reality and our imagination. Written for the exhibition, The Delightful Land, at The Horticultural Society of New York, Aug 7 – Sep 13, 2013.